Top 10 Game! *#1 Bingo Game *Top Game in 100+ Countries *Played by millions! *Get 2500 Coins FREE for a limited time! 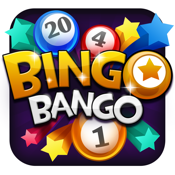 Break the rules of traditional Bingo with Bingo Bango, a fun & addictive game packed with tons of crazy items, powerups, collectibles and much, much more! Challenge your friends & thousands more real players around the world to see who lady luck really favors. Hunt for hidden treasure across 10 unique themed locations each with dynamic stage effects that alter your hunt! Will you choose to gamble your winnings or simply play it safe? Whatever your style, Bingo Bango will change the way you play Bingo forever! - 10 unique fantasy rooms with secret effects! - Search for rare items in TREASURE HUNT mode! - Change the way you play with crazy powerups! - Play online with thousands of REAL PLAYERS! - LIVE CHAT with players all over the world!